We’re delighted that Nathan Tomlinson was awarded this year’s CIFE college prize. 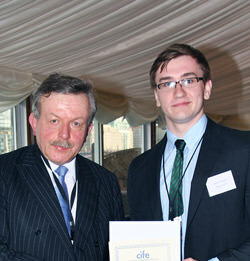 Nathan received his prize from CIFE President Lord Lexden in a ceremony held at the House of Lords this March. Nathan joined MPW Birmingham in September 2012 to study one year A levels in Physics, Mathematics, Further Mathematics and Chemistry achieving three A* grades and one A grade. Nathan will now take up his place at Imperial College to read Physics; his achievements are all the more remarkable considering some of the personal difficulties which he has faced in recent years. Nathan is without doubt an exceptional student and we look forward to following his career with interest.